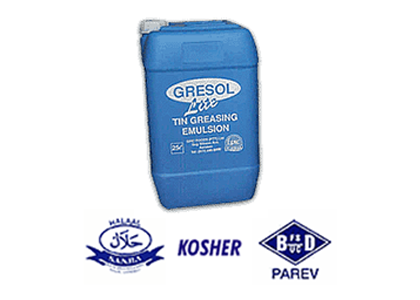 Gresol Lite is a vegetable oil based emulsion of medium viscosity. The edible oil fraction consists of the finest quality vegetable oils, which have been fully refined and deoderised. Conforms to both the Muslim and Jewish authority food standards. Gresol Lite is a low oil emulsionand has been specifically formulated as a more economical baking pan release agent, suited for spray or brush application. 25 litre good grade PVC containers with screw-on cap. Conforms to both the Jewish and Muslim authority food standards. This is mostly caused by high temperatures.